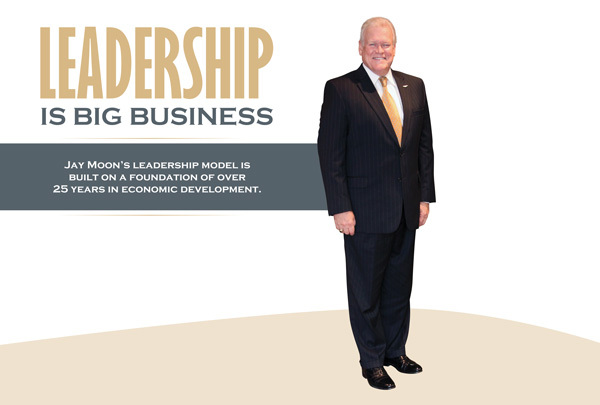 Jay Moon’s leadership model is built on a foundation of over 25 years in economic development. The Mississippi Manufacturers Association (MMA) has had the benefit of exceptional leaders providing a united voice for manufacturing in Mississippi for over 60 years. In recent tenures, leaders have been chosen in part for their demonstration of manufacturing leadership excellence with specific, successful manufacturing companies in Mississippi. Jay Moon, who has served as President and CEO for the MMA since 2002, was chosen for different credentials — in particular, his economic development experience. Jay Moon has had his eye on economic development and international affairs since his undergraduate career. Moon earned his Bachelor of Arts degree in International Relations and a Masters degree in Public Administration from the deeply southern, highly-ranked program at the University of Georgia. After completing his academic degrees, Moon served in the administration offices of the Georgia Department of Natural Resources and the Georgia Secretary of State He then joined the Legislative Research Commission for the state of Kentucky, where he was granted the title of Kentucky Colonel, the highest title of honor bestowed by the Commonwealth of Kentucky. Moon then moved to Mississippi, where he became the Director of Community and Economic Development in the office of Building and Planning for the city of Gulfport. His next career evolution brought him to Jackson, Mississippi, where he was recruited to the role of Deputy Director for the Mississippi Development Authority. It was in that role that Moon was the lead project manager in charge of bringing Nissan to Mississippi, a $1.5 billion deal. Moon’s father was a career Navy man, and their family lived in several locations in the states, and internationally, while he was raised. Some the places he has called home include Florida, Illinois, Georgia, Virginia, Kentucky, Mississippi, Caracas, and Venezuela. Moon’s upbringing and career path gave him a perspective on people that transcends borders and cultures. His unusually rich life experience has been an obvious advantage. Today Jay Moon leads the MMA. The organization represents more than 2,200 manufacturers and associate members and is the most recognized voice in manufacturing in the state. Moon serves as the chairman of the Mississippi Workforce Investment Board, chairman of the State Longitudinal Data System board, and chairman of the Manufacturing Extension Partnership. He also serves on the board of the Japan-America Society of Mississippi and on the board for the University of Mississippi’s Center for Manufacturing Excellence. One of the roles of the MMA is to predict and track key strategic trends in manufacturing for Mississippi. Moon mentions three areas the MMA has taken specific interest in supporting. A draw to Mississippi by offshore companies who are attracted to the southeast due to lower energy rates and offsets in labor costs. The need for a nationally competitive, certified labor force with skills and training instantly recognized in any part of the country. Growth in both manufacturing and parts supply. Moon points out that Mississippi is a state of higher standards. “Mississippi is a place of integrity. It is the people of Mississippi that make the difference. There is a sense of pride in where we live. We are people who back up what we say and are willing to be held accountable for our actions. We are people that understand value.